We recently were looking for tree removal companies to remove a tree for us on our property. We have included this topic in our website, since many homeowners must deal with mature trees on their property. They are large or encroach on their homes, or even as an emergency after a wind storm. Homeowners can do some of this work themselves if they have a chain saw/ They need to know how to safely cut down a tree without causing damage. Especially to nearby buildings, other trees and shrubs and your neighbor’s home. This was the situation in our case. As you can see it is very close to the house. I was concerned about taking this tree down without any damage to my home and my neighbor’s home. 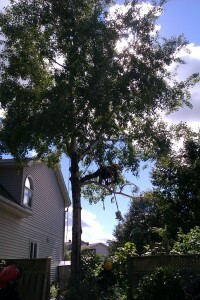 You can search the internet to find local tree removal companies in your area. You will probably be able to find quite a few. However the best way is to ask for references and check them out. You want to hire a company that will do the work safely. They need to have all of the right equipment and ensures that there is no damage to your home or shrubs. In our case I happen to see a company removing a tree in our neighborhood. I watched them for a short while and quickly realized that these guys, (there were four of them) not only knew what they were doing, but did everything very safely. They were also taking all of the necessary precautions to make sure that nothing around the tree including the lawn was damaged in any way. Once I had observed then for a short while, I decided that this company was the one I was going to use for the removal of our tree. Having the right equipment is so important. This company showed up with two trucks. Also a huge wood chipper that can take logs that are at least 25 inches in width! As the tree came down, they fed the limbs including the trunk into the wood chipper. In seconds it was all ground up into small wood chips. Amazing machine! 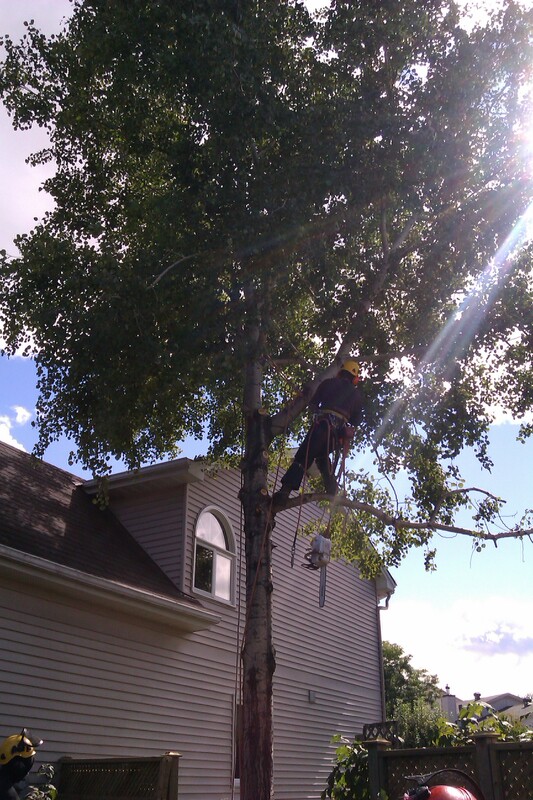 The technician in the tree has a small hand chain saw that can be held with one hand easily. The chain is extremely sharp and cut through the wood as if it was butter. this makes the job go faster and safer as well. He would hold that chain saw with one hand and the limb with the other and cut through it with no effort at all. The safety equipment is also part of the equation that not only keeps the operator safe, but makes the job easy as well. He was lashed to the tree and with his tree climbing spikes was quite comfortable. He was perched on the trunk of the tree cutting off the next limb. This particular picture on the left shows the arborist on the trunk of the tree. He is lashed to the trunk preparing to cut off the next 3 feet of the trunk. He just worked his way down the trunk until he reached the ground. All of it was fed into the wood chipper. They did a great job as well cleaning up. They did not damage any of our plants or even a fence that was within 2 feet of the trunk of the tree. We were very happy with this company. If you would like more information about them or a link to their site, refer to our original post on reliable tree service, or click on the category “Tree Service”. This will be the last post for a little while on tree services. leave difficult jobs to the professionals due to safety issues. Other jobs can be done by the home owner which can save you a great deal of money. Just make sure that you do this work in a safe manner.